Airlift bioreactors are used for cell culturing, pallet form fermentation, and immobilized enzyme reactions. Typically, airlift bioreactors are used when the desired reactants and/or final products are in a gaseous state and for aerobic cell cultures. ﻿Airlift bioreactors are used for cell culturing, pallet form fermentation, and immobilized enzyme reactions. Typically, airlift bioreactors are used when the desired reactants and/or final products are in a gaseous state and for aerobic cell cultures. An airlift bioreactor works by agitating the contents of the bioreactor pneumatically using gas. The gas used for agitation can act to either, introduce new molecules to the mixture inside of the bioreactor, or remove specific metabolic molecules produced by microorganisms. Airlift bioreactors have a built in bubble column designed to release gas into the bioreactor. 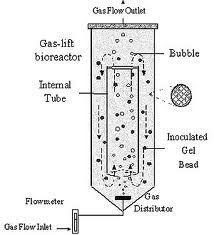 Gas is usually injected into the bubble column at the bottom of the bioreactor. Mixing occurs as the bubbles rise through the bubble column to the top of the bioreactor.